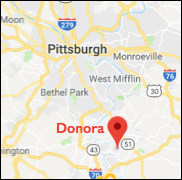 For decades during the mid-1900s a Chamber of Commerce sign at the Donora town line read, “NEXT TO YOURS THE BEST TOWN IN THE USA.” Donorans found an odd pride in being a second-best town, no matter where a visitor came from. Perhaps that was to be expected. The town didn’t originate naturally, as a place people moved to because they liked the area or as a natural outgrowth of an urban area. No, it originated because industrialists in Pittsburgh thought it would make the best spot to build steel and zinc mills.